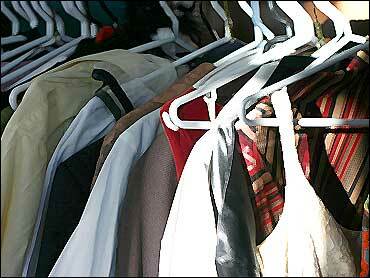 For many of us, closets are a dumping ground for almost everything, and they can get awfully unruly. But don't fret - you can get them in ship-closet-shape! On "The Early Show Saturday Edition," Elaine Griffin, a Better Homes and Gardens contributing editor, provided pointers on organizing closets and cleaning them - making clutter a thing of the past in the process and enabling you to utilize every inch of space. She told what to keep and what to chuck. Identify items that are better stored elsewhere in your home. Discard items not worn or used in two years. Either donate to charity, give away to friends or throw out. Try to get these new skinny hangers -- They are just as strong as wooden hangers, but half the size. Be sure to get them in all the same colors -- or his & hers -- so they look cuter! Use your closet door -- it's prime real estate for hanging accessories -- shoes, belts, ties. Hooks from the hardware store are perfect to use for this. Take advantage of untapped storage space -- Side walls are great for storing accessories. Double Your Space -- double closet rods -- one over the other -- are the best way to squeeze more storage space out of a closet. Be sure to measure the clothes you'll be hanging there and allow another 6 inches of clearance above and below each rod. Blouses, shirts, skirts, jackets, and kids' clothes will all fit on double rods. If you have a super-deep closet, do the same with front and back rods. Organize by first by item and then by color. So, all shirts go together, and then all white shirts go together. For suits, hang the jacket with the pants. And don't get lazy about hanging stuff up! Take the time to put it back where it belongs. Choose hangers, storage boxes, shoe storage options and accessory organizers to complete the solution. Clear containers or those with labels will help you save time because you can quickly identify the contents, or baskets with labels if you can look down into them. Add a small trash can to hold clothing tags and corral trash from pockets at the end of the day. Store sweaters on shelves in manageable-sized stacks using sweater dividers to keep them from turning into leaning towers of Pisa. Even better, store them in sweater boxes with well marked labels. And remember! Cashmere is a treat for moths -- store your cashmere sweaters in lidded plastic containers during the summer. Finally, be committed to your closet! GETTING organized is easy -- it's STAYING organized that's work! Remember the Cardinal Rule of Closets: "When you acquire, you must also discard!" When something new comes in, always try to throw something old out.